The grass-court major is underway in England as Roger Federer easily defeated Dominik Hrbaty (6-3, 6-2, 6-3) in his first round match. Other ranked seeds to win yesterday include number 3 Novak Djokivic (7-5, 2-6, 6-3, 6-0) and number 5 David Ferrer (7-6, 6-3, 1-3, retired). Number 7 David Nalbandanian was the only high ranked seed to lose in the first round, falling to Frank Dancevic (6-4, 6-2, 6-4). Rafael Nadal is currently in action against German Andreas Beck and Nadal has taken the first set 6-4. Four seed Nikolay Davydenko is also in action against a German. He’s facing Benjamin Becker and has dropped the first two sets (4-6, 4-6) so he will need a comeback to make it into the second round. Looking at the bracket as a whole, it is clear that Nadal has a much easier draw then Federer. Federer could see a fourth round match up of Lleyton Hewitt or Fernando Gonzalez and a quarterfinal match against David Ferrer. Those are two tough opponents to face before even reaching the semifinals. If he does reach the semis, the number one ranked player in the world could face third seed Novak Djokivic. Nadal, on the other hand, would face Richard Stepanek in the fourth round and 8th seed Richard Gasquet in the quarterfinals. If he reaches the final four, Nadal could face Davydenko or 6 seed Andy Roddick. With Davydenko losing, it only makes Nadal’s draw easier. 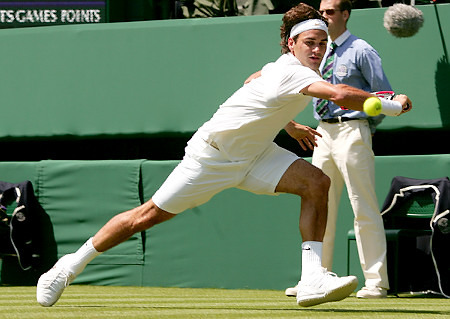 However, I still expect Federer to make the Finals as he is just too good on grass. For the first time in a couple years though, I think Nadal has a legitimate chance of upsetting Federer. Nadal is coming off a victory at the Tour Artois Championship, a grass court event, and defeated Federer easily in the French Open. A finals match up between the number one and number two ranked players in the world would be unbelievable and I expect it to happen. Quite frankly, I’m not much for Tennis. But it would be nice to see Venus & Sarina Williams face off in the championship round. It would defenitally the Tennis version of a Manning Bowl championship game. Your are a superb internet marketer video guitar lessons. The positioning launching acceleration can be astounding. Them sort of seems that you’ll be performing almost any one of a kind technique. Additionally, The actual articles are usually masterwork. you’ve carried out a fantastic activity during this topic!